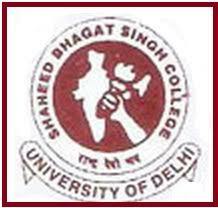 Promoted in the year 1967, Shaheed Bhagat Singh College (SBSC) is a co-educational institute and a constituent college of the University of Delhi. The college is ranked amongst the top colleges for commerce in the country and aims to promote quality in education and constantly strive for excellence in teaching, research, student support and overall management. Candidates are required to submit the print out of the admission form downloaded from the University of Delhi Web Portal and the set of college forms, for admission to the First year (Semester I) of three Year CBCS under Graduate Programme. Admission will be done on the basis of merit by the Admission Committee and the Principal. The premises of the college is spread over green land with good infra-structure facilities like well-equipped laboratories, Computer center, conference hall, Audio-Visual Room, Community Hall, Gymnasium, Good play ground etc. Placement Cell organizes pre-placement presentations by recruiting organizations which is followed by the actual recruitment process. The students have been placed in companies like google, DE Shaw, PwC, India Bulls, RBS, KPMG, Grant Thornton, Ernst & Young, global shared services etc. Are you Interested in Shaheed Bhagat Singh College.